The Intuition line generally originates from somewhere near the Life line, down low, and slants at a left diagonal through the palm (if reading the right hand). It may or may not touch and/or cross the Head line and Heart line. It may be solid, or broken. The line may also appear only at the Head or Heart line. For more help locating it, in general, it makes a triangular shape with the Life line and the Head line. The depth of the Intuition line shows the depth to which this person reaches his/her intuitive self. If very deep, obviously a solid connection. This is seen on other readers/psychics, and/or natural mediums. A shallow or faint line shows a sporadic connection to the intuitive self, and when it “speaks” it is probably often challenged by the person, and/or ignored. For some, their Intuition line may be deeper on one area of the palm and not so in the other area. A strong line in the Life line (low on the palm) shows their intuitiveness comes through to them the strongest “on the gut level.” They may just have “good gut instincts” or often show up at the right place, at the right time, for no reason at all. A strong area near the Head line signifies a person whose intuitive self comes through “at the mental level.” They may often experience dreams that feel more like spiritual visitations, and experience “flashes” of clear-seeing, and/or clear-knowing (the feeling of “just knowing” the information necessary). 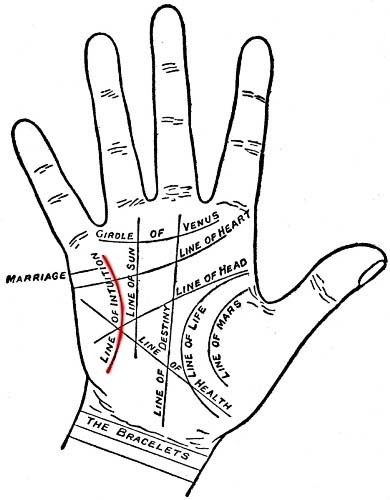 Those with a strong Intuition line at the Heart line (the top of the palm) are natural empaths. Their intuitive self speaks through “the heart chakra” and they may find their own emotions are strongly colored by those around them. They may have difficulty in large crowds due to their natural abilities to feel the emotional context of those around them, especially if they are not practiced at setting up internal filters in such situations. They are often the folks who call us when we are hurt, as if somehow they “could just feel you needed to talk,” and acted upon it. There are those who do not have this line on their palm. This may indicate a person who has no real connection to their own intuitiveness. About an eighth to a quarter of all the palms look this way. When we see no Intuition line, I usually disregard mentioning it altogether in the process of a palm reading. We, commonly should not point out their missing attributes while reading, as there’s lot to focus on that "is" there. Line of intuition indicates a tendency to presentiments and show an aptitude to the occult.